Sheffield Bach Society’s 69th concert season begins with a fascinating look at French music, including the magnificent Durufle Requiem, marks the end of World War One hostilities with the choir’s first performance of Karl Jenkins’ “The Armed Man” and also includes some of our regular favourites, such as “Messiah” at Christmas and “The St. John Passion” at Easter. Something for everyone. A programme of beautiful French music, including Poulenc’s wonderful Organ Concerto played by the cathedral’s new Music Director Thomas Corns. Tickets: adults £16, concessions £13, students £5 on the door only, accompanied under-16s free. Tickets available online or on the door. More about buying tickets here. The choir marks the 100th anniversary of the end of World War One with a moving programme, including Mark Blatchly’s beautiful version of Laurence Binyon’s famous poem ‘For the Fallen’. 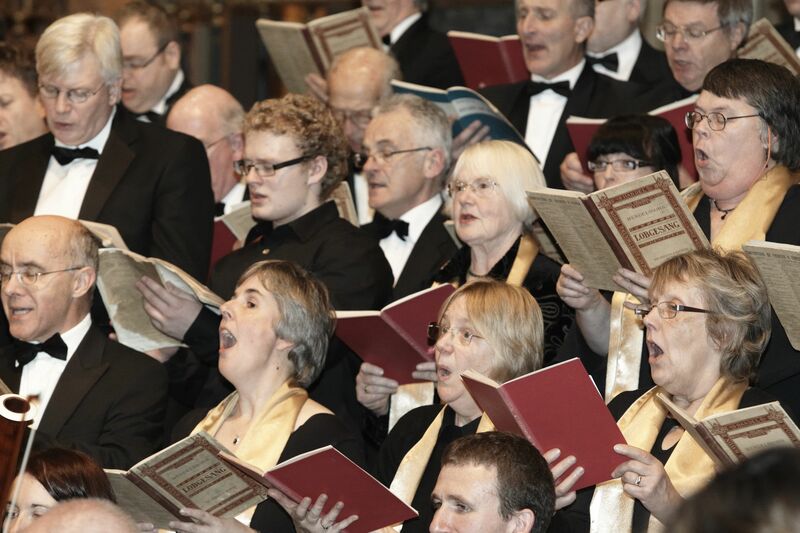 Sheffield Bach Choir’s annual performance of Messiah alongside the National Festival Orchestra, conducted by Dr Simon Lindley,, offers Sheffield music lovers a splendid opportunity to include a live performance of Handel’s wonderful oratorio in their Christmas preparations. With Sheffield rising star Ella Taylor as soprano soloist and exquisite counter tenor David Allsopp singing the contralto movements, tenor David Brown and bass Quentin Brown, this will be a memorable performance. Another popular annual outing for Sheffield music lovers, this time to join the choir to sing Messiah in Dore Parish Church. Conducted by the choir’s President Professor George Nicholson, with Dr Simon Lindley on the organ. With mulled wine and mince pies in the interval, this will be a wonderfully festive evening. Bring your own score, or hire one for a small fee. Tickets £12 including mince pies and mulled wine. Buy tickets online or on the door. NB: This event is not included in the season ticket . More about buying tickets here. The choir sings each of Bach’s most celebrated choral works in rotation every three years, and this year presents his splendid St John Passion, written during his first year as director of church music in Leipzig and first performed in 1724. With an array of wonderful soloists, including Stephen Liley as the Evangelist and Thomas Hunt as Christ, this performance is a must for local music lovers over the Easter period. The choi r presents a programme of American music guaranteed to lift your spirits and have your feet tapping along! Donald Hunt’s An American Serenade is a celebration of the art of George Gershwin, Jerome Kern and Cole Porter, with individual numbers for smash hit shows such as High Society, Porgy and Bess and Show Boat. The choir will sing the version with instrumental accompaniment added especially for Sheffield Bach Choir five years ago. The programme will also include Feel the Spirit by John Rutter, an infectious suite of spirituals featuring mezzo soprano Joanna Gamble, together with some new arrangements of American classic songs specially orchestrated by our own distinguished President George Nicholson, Professor of Composition at Sheffield University. Tickets: adults £12 concessions £10, students £5 on the door only, accompanied under-16s free. Tickets available online or on the door. More about buying tickets here.